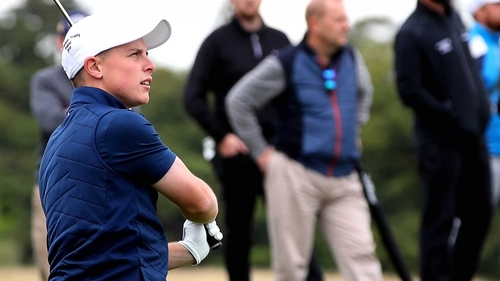 Ireland started the second day of the the World Amateur Team Championships just one stroke off the lead but they could hardly have foreseen the extent of a slump which dropped them nine strokes off a podium position with one round to play at Carton House. Ireland had risen to a 19-under par total after two rounds and had been in a tie for second place but midway through the third round, with all three players over par figures in their rounds, they dropped as low as 14th position. Only for a late-round burst of three birdies by Conor Purcell in a one-under-par 71, they could have sunk further as Robin Dawson and John Murphy could only manage a pair of 74s. "We were all in a very good frame of mind going out but sometimes things just don’t go your way in golf and this was one of those days," said Murphy afterwards. "But we have another day to shoot a really low number and see where that gets us." Ireland’s third-round total of one-over-par dropped them back to 18-under, 12 strokes off the leaders New Zealand on 30-under. The Kiwis are three shots clear of three countries on 27-under - the USA, Spain and Thailand with Ireland now back in 12th place, nine strokes off a medal position with one round to play.